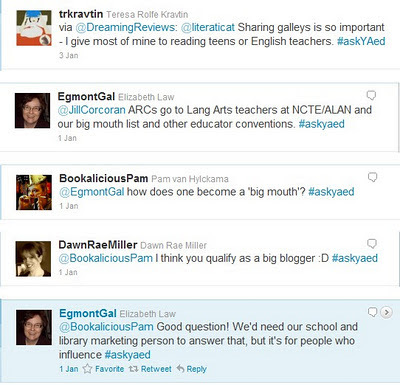 We Heart YA: Twitter Tuesday--Do ARC's sell books? Where are the rest of the best, you ask? Well, I admit I just didn't keep up this week. And every time I popped over to twitter, not much was happening. January's like that I think. But then I realized that there was a hashtag the previous week that I wanted to discuss #askYAed. I noticed some of you were about, and there was one topic that arose that I have been thinking about ever since: Do Advanced Reader Copies sent to book bloggers lead to book sales? Some teachers piped up and said they often share galleys with students, and before long the benefits of ARC's heading to teachers took over. When it comes down to it, teachers are the most likely to get books in the hands of teenagers, right? Hmmm. So wouldn't that be book bloggers with lots of subscribers? Some book bloggers stated that they get sent books that they don't always get to or that they get books they didn't want to review in the first place. I can see why this would be inhibitive to sales, and might not be a good investment on the part of a publisher. Something to think about. Others passionately defended the fact that most of their book recommendations (and therefore purchases) come from book bloggers. Seriously, ARC's are not often wasted. But one person pointed out that it's very hard to come up with data that directly links a book blogger to a book sale. All you have to go on is the feedback from readers. How do you figure out where sales are generated? So, dear readers, while we might not all be interested in the "business" of books, we'd still like to know: What makes you buy a book? For us, it's starred reviews, word of mouth from trusted reader friends, sequels from authors we already know we like, twitter buzz, goodreads, amazon, and, yeah, book bloggers! We Heart YA does not review books for our site. We don't get ARC's from publishers, but sometimes we win them or sign up to get one if we are particularly excited about it. And we always pass these on (unless they're difficult to part with). This is because sharing books we love is our own personal way of recommending them. In fact, any book we talk about is a book we think you'd like to read. It's as simple and genuine as that. Do ARC's sent to book bloggers lead to book sales? Of course. Why wouldn't they? But the best way for a publisher to guarantee a sale is to invest in a story by an author who has perfected their craft. To get these stories into the hands of YA readers through strong word of mouth. To take risks on well-written YA, even if it's not the "trend" or "what sells." As both a blogger and teacher, I can say that I LOVE ARCs and see them as very effective ways to share with people/students books that they might not otherwise pick up or be exposed to. About 99% of my YA ARCs end up in my classroom (I do keep a couple back because I can't bear to part with them--though I do usually buy a hardcopy for the class). Can it be proven that my blogging and book talking with students directly affects sales? Sort of. I've had students tell me they loved a book so much, they asked for everything by that author for Christmas (true story--it was Tera Lynn Childs' books). But can I prove it in solid figures? No. Still, I know bloggers and educators make a difference in sales. I think publishers should keep in mind that ARC's really do help spread the word. Now the next debate is: paper or plastic (ereaders, that is)? Personally, if I receive an ARC, I usually don't go out and buy another copy of the book unless there's a different type - such as trade paperback or hardcover - or edition I want. But when it comes to buying books, now that I've been a blogger for three years, I usually ONLY buy a book if I've heard about it. The only time I don't pick a book from the library or buy something I've heard about from the internet, are in used book stores. I highly value bloggers, online personalities, authors and friends who recommend books, and I often look over books and pursue others due to their opinion. Then again, I don't know in the grand scheme of things if book bloggers are a big enough demographic to make ARCs worth it, and I don't know about the rest of the reader world and their experience with ARCs. @Emma...interesting and informative feedback. thanks! We don't often buy extra copies of books unless we're bowled over by it (Daughter of Smoke and Bone, as an example.) And, yeah, obviously the blogger world is real to us who take part, but outside what's happening with those ARC's? hmmm. I'm still new to the whole blogging thing, and even newer to the whole ARC thing. Having said that, I very much hope that publishers will keep doing ARCs so that I have a chance at some of them! Do ARCs sell books? Personally, yes. I have ARC copies of books that I've loved so much that I have to add them to my shelf to support the author. After all, the author or publisher was willing to give me a chance to read their story that I want to be able to support them in return. @BooksforYAs...thanks for commenting! I think they will continue ARCs because they're just so important for word of mouth. I think for smaller publishers, though, they are more selective. They have to be more careful with their budget. I really only have anecdotal evidence, but I think ARC's do sell books. At least to some degree. I mean, I've definitely bought books (like Daughter of Smoke and Bone) after reading an ARC that someone has lent me. And for the ones that I actually own, no I don't usually go buy the regular copy, but if it's a good book, I will sing its praises to all my friends, and all over the Internet. Since that kind of word-of-mouth influences ME to buy books, I have to assume it does the same for other readers. I think this debate is so interesting. I know personally, a lot of my ARCs end up in one of my teachers from HS's classroom, since she runs a lot of classes that are very much just pro-reading and you have to read X amount of books of your choice throughout the semester. I also know I'll get a ton of comments or tweets that'll say I bought this book because of you, etc, but there never is a way to actually quantify those numbers. interesting debate. i agree with one of the one that says an arc is most effective if it's sent to a blogger who wants to read them & is very enthusiastically about the title. many of the unsolicited arc/finished copies i get usually just sit around too. however, i do know bloggers make a difference. i am very much influenced by other bloggers' reviews on what books i purchase or which ones to avoid.